Thank you Paul. Not a purchasing criteria, though I do think it is the future. I just wanted to know what to expect and I don't think I can access the manual without purchasing. I noticed that my CFX is also around 20 GB larger than advertised. I've also noticed that in MainStage and GarageBand my mic pan feature doesn't work. I can pan any mic to the right or left and there is no change at all. However, it works fine in the free version of Vienna Ensemble. Unfortunately, I can't record in the free version. Any idea why the pan doesn't work in Logic? Is this "only" about the Synchron Pianos software? What speaks against using Synchron Pianos in Vienna Ensemble, plugged into, e.g., Mainstage, to work around this issue for now? That was a good suggestion but unfortunately it didn't work. Even running Synchron Pianos in Vienna Ensemble plugged into MainStage the Pans still don't work. I can only get them to work in Vienna Ensemble alone. Is this something you're aware of and are working on? Thanks. We will investiigate. MainStage is a rather unusual host for our existing products, but we will see what we can do to fix this. How does the new "Synchron Piano software" supports huminazing when playing static precise Midifiles. E.g. when playing trills or tremolo. There is no humanizing available for piano (there are no intonation problems on a well-tuned piano ). Thank you for the wonderful customer support. I just checked and the Mic Pans on the Synchron Pianos Mixer page work just fine with Mainstage here - please make sure to deactivate the built-in reverb though! ScreenU0020ShotU00202018-12-10U0020atU002011.47.17.png (391kb) downloaded 13 time(s). But playing trills or tremolo have a robotic sound. How can I change my Midi-File to get a realistic trill or tremolo in Cubase 10 ? Where did you hear that robotoc sound? With so many velocties and samples in the background, you won't run into trouble! It works now. Your picture helped because I realized it has to say "manual" under setting on the channel strip. Essentially I have to reload synchron piano into the channel strip every time I open MainStage otherwise the pan feature won't work if I open a previously saved concert. Again, thanks for the help. After several days with this unexpected new piano library, I am totally in love with it... if only I could actually use it for dependable work. I am hoping someone can tell me what I can do make it work on my system, as any orders for upgrades should be done ASAP in order to arrive in time for making maximum use of this library during the holiday week. I have written up very detailed reviews in other forums, and at this late hour, do not have the energy to write yet another review, so will just summarize and say that this is the first Steinway library that makes me feel that I am sitting at the piano and not playing computer samples. It took a lot of work to get the settings I like for an intimate sound suitable for jazz, but I am 100% of the way there now, with no further tweaks needed. :-) The mids in particular, are so articulate and clear that it also prevents mud in the lows and overly harsh high notes. Briefly, I am using the Royer Ribbon Mic, Neumann Tube Mic, and Sennheiser MKH 8040 mid mics, in decreasing levels for the blend. I'll write up my detailed settings later. I was "almost there" on Sunday but then found even better advice at Piano World, then fully refined and finalized my settings for jazz and chamber settings. The performance issue is a blocker. I need to be confident that whatever I order tonight or tomorrow is highly likely to solve the problem. Even if I remove all pedaling, I still get glitches and audio gaps due to the CPU spikes, and that is after doing everything possible to opitimize performance. It gets worse if I have Continuous Damper vs. on/off, but like I said, some stuff chokes regardless of pedaling. So I am convinced my system needs a boost. Last summer, my 2010 MacPro died a sudden death at the start of a five day holiday weekend, so out of desperation I bought a brand new 2017 iMac Pro, top-end stock model, as I had immediate deliverables. So I am more limited in what I can do with upgrades than before, but it is also a more modern machine so that helps some. I have not yet upgraded the RAM from the stock 8 GB. I notice with the three mics selected and Reverb turned off, it takes upwards of 20 minutes to load, and fills about 0.9 GB of RAM. So I'm hesitant to assume ordering 32 GB of RAM tonight is all that I need to do to make the CPU glitches go away, as I doubt I'm hitting that limit yet. The iMac 18,3 has a Fusion drive, which is hybrid SSD. I only use it for apps and stuff that isn't happy elsewhere, just as wth my previous computers. And I couldn't find a way to partition it; I think the "Fusion" technology prohibits that as the OS manages a lot of complex ways in which the drive gets divided up. But I have plenty of space and could fit all of my Synchron libraries there. I just don't know if that's advisable; I always keep data and libraries off the system drive. I am using a 10 TB G-Tech hard drive connected via USB3. I am less concerned, for now, about the load time, than whether the CPU spikes may also be related. I figure once the personal preset is loaded, that everything it needs is in RAM and that the storage device for the library itself is no longer relevant. Is this correct? This iMac's CPU is an Intel Core i5, 3.8 GHz, 4-core single processor machine, with 256 KB of L2 Cache per core, 6 MB of L3 cache, and is still running Sierra as I have been mid-project for too long to yet risk going to High Sierra and then Mojave. It is surprising to me that I'm the only one to have had performance issues. I didn't run into this with the CFX, but I haven't used that one much yet either, as Yamahas are not my favourite pianos. It's the best Yamaha I've ever heard though, so I knew I would want anything else that is done for this new platform. you're limited by your HDD's. The Synchron Piano, along with any modern library, needs an SSD to perform well. Only a very small portion of the samples are loaded into RAM, the rest are streaming directly from disk. Using an external TB3 SSD drive would be optimal in your situation, that will take care of your glitches and take your load times down to a few seconds. On an internal SATA SSD I can load up a preset with 3 mics within 5 seconds, and using an internal Intel Optane 905P PCI-E drive I get the same thing loaded in about a second. Martin, thank you so much for clearing that up. It's the internal workings that I can only guess at! Now I just have to decide whether to buy an external SSD or temporarily move things to the Fusion drive and re-evaluate -- I guess I can copy the libraries and just find out, then delete if it doesn't help (much). I'm hesitant to buy another external drive just because I don't like daisy-chaining -- it's the main reason I freaked when I had to go from a MacPro to an iMac (the so-called "trash-can" edition of the MacPro requires external drives so had limited appeal to me when my 2010 model died). I could, however, "time-share" one port with the Time Machine drive, which I usually turn off during recording anyway (except when I forget -- so this would be a better way to remember!). I appreciate you giving such a complete yet concise answer. I think it will help others besides myself. The TB3 ports you have on the iMac Pro should provide 40Gbps bandwidth each - which is plenty enough for a few drives to share. USB-3 (as you are using for the 10TB HDD) is 8x slower at 5Gbps. I'm not aware of the exact details of port sharing on your Mac Pro model - it could be that some ports share resources. Definitely an SSD is the way to go, and SSD prices have dropped dramatically in the last six months, so this is a good time to buy. In regard to experiencing the problem on the Steinway but not the CFX: it's apparent that the Steinway is significantly more demanding of the CPU. With the same number of mics (and both sample sets on the same SSD drive), I can run the CFX at a lower latency without artefacts than the Steinway. I'm not sure why that should be; perhaps Martin can comment? Thanks; when I bought this box last summer, the TB3 HDD drives they had at Fry's were WAY slower than the USB3 HDD drives, and FAR more expensive. They said the ideal was on paper only but might be met within a couple of years, and it seems that is now the case when I look at newer TB3 HDD drives, and that they are now price-comparable with USB3 HDD drives (which is now on the way out) or cheaper. I'm not going to experiment with the internal drive as it identifies itself as an HDD under system specs, so I doubt any sector of that "hybrid drive" really and truly behaves (performance-wise at least) like a real SSD. I'll check TB3 SSD drive prices and capacities after my rehearsal tonight, and place an order. At least 2 TB for sure, and way more if the price scaling isn't exponential and is instead rewarding vs. punitive. Above picture and video show my problem. 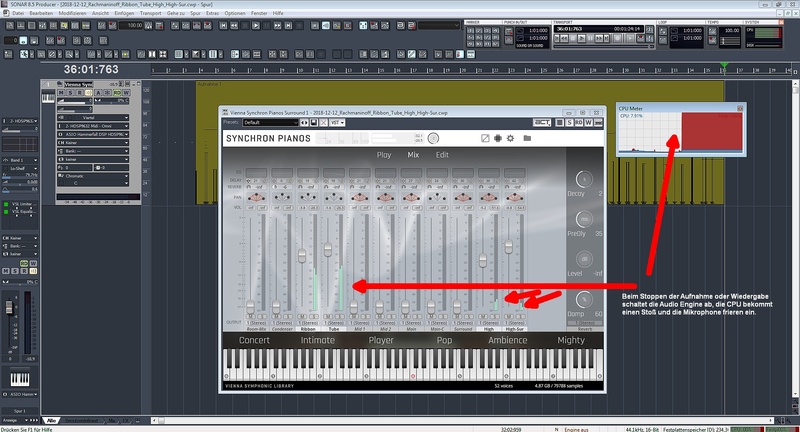 When working with Synchron Steinway, it is not possible to stop playback or recording without automatically turning off the audio engine after a CPU peak. A further work is only possible if I unload all the microphones, restart the engine and load the microphones again. The bug is reproducible, If i play live without recording, everything works, but as soon as I stop or start playback after recording, the engine hangs. Sometimes it comes after such a mistake also to a permanent humming and a level continuously displayed in a microphone, happened so far with the RoomMix but also already with the tube microphone. The Steinway is my first synchron instrument. There is no experience with other synchrons. Steinway_CPU_Stopp.jpg (578kb) downloaded 7 time(s). The best idea with specific troubles/requests is to contact us directly via , this way you will get the fastest answer from one of our team members. Of course I'm already checking what could cause this. BTW: Forum language is english, and we're doing our best to stick to that.